Hello. I've recently become interested in the bluish shades found in the early 2 anna settings. In The Classic Stamps of Nepal there is Setting 5 with deep blue and blue-violet, and setting 9 with a dull violet-blue. Additionally, setting 20 has a violet-blue variety. Is there any reliable way to tell the difference between "dull violet-blue" and the blue 2 anna error of color? In The Armand E. Singer Nepal 1772-1961 and beyond, it is described as just "blue." 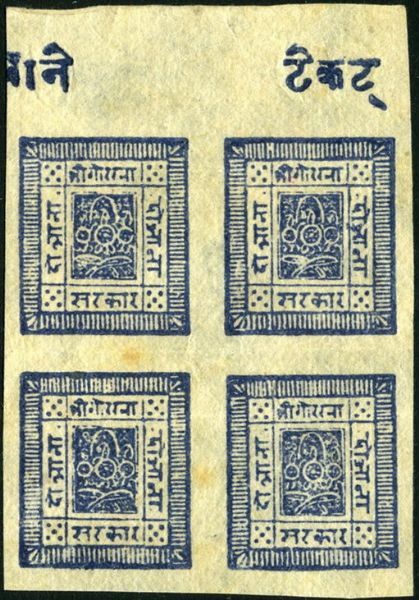 In The Classic Stamps of Nepal, though, it's referred to as "deep blue" and "dark blue." Perhaps if anyone could show me an example of the contemporary 1 anna blue that it shares a shade with this could clear this up for me. Thank you for any advice. As already indicated in the other threat regarding the color guide for the classic issues, the main problem on these issues is that the mentioned catalogues/handbooks does not specify what color reference had been used. We only can hope that a future revision of the handbooks will include such a reference. I have noticed that the shades for the 2 anna 1886 thin paper printings seem to slide in color from a blue or blue with a very slight touch of violet shade through various violet blue shades to finally what would be termed distinctly violet shades. Since violet is a mixture of red and blue, it seems to me that the original blue shade might have resulted because the two anna values were printed after the one anna values by simply adding red ink to the blue ink left over from the one anna printings. It appears to me that the red ink might have been added on a sort of trial and error basis until the proper color was achieved. Given the low income level of the country and the general disregard for consistancy that would characterize a craft verses industrial based society, it would come as no surprise that these trial printings would simply be mixed in with the final lot of stamps shipped to the postal department rather than being thrown away. Paper to the Nepalese printer would have not been the nearly worthless commodity that it is to us and would not have been wasted simply because the printing varied somewhat in color from the prescribed outcome. Thank you very much, that's coming to some sort of conclusion. Perhaps it's not as clear-cut as outlined in The Classic Stamps of Nepal. It only gets more difficult to find out something with surety the more time passes. The Post Office Department is not running a jackpot operation. I haver heard that Wolfgang Hellrigl is considering a revision of his Nepal Handbook. Maybe we can convince him to choose, based on the feedback of other collectors, a color guide which is easy to purchase, easy to use and comprehensive enough to cover the shades. I mentioned it earlier, the biggest problem in naming color shades is not defining a color reference. Do you know where we can contact Dr. Hellrigl to show our support for this? A counter argument for reference to a color guide could be the fluid spread that a sheet of stamps can contain. In confining a certain color the great variation would be lost. In counter argument, The Classic Stamps of Nepal should contain a couple colors in a color guide between which or on that particular shade is. Or does anyone else have a better suggestion? Thanks. Yes, may be it is a good way to compare the colour with the contemporary 1 Anna. This is the 1 Anna of 1886 - setting 4, 5 or 6. Unfortunately I do not have a 1 Anna definitely of one of these settings. I have a block of 4 of the 2 Annas I suppose to be of setting 5 (error of colour). It looks dark blue similar to some 1 Anna stamps I got.